Jazz up your look by wearing this top presented to you by Kraus. It has been crafted from a fine quality fabric that lends it a good finish, while the round neck and the three quarter sleeves add to its design. It also comes with a lace pattern, which gives it an elegant look. 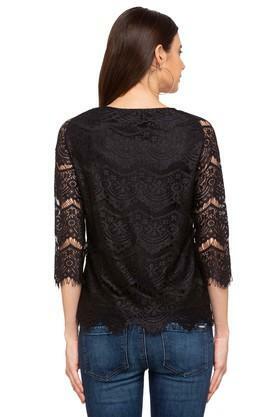 Get admired for your dressing sense by wearing this fashionable top on any special occasion. Tailored to perfection, it will go well with a pair of shorts and heel sandals.